Inspiring spaces designed for practical living in the heart of the Van Aken District. Situated within historic Shaker Height’s new downtown—Upstairs offers a generous and contemporary collection of apartments designed for living well. 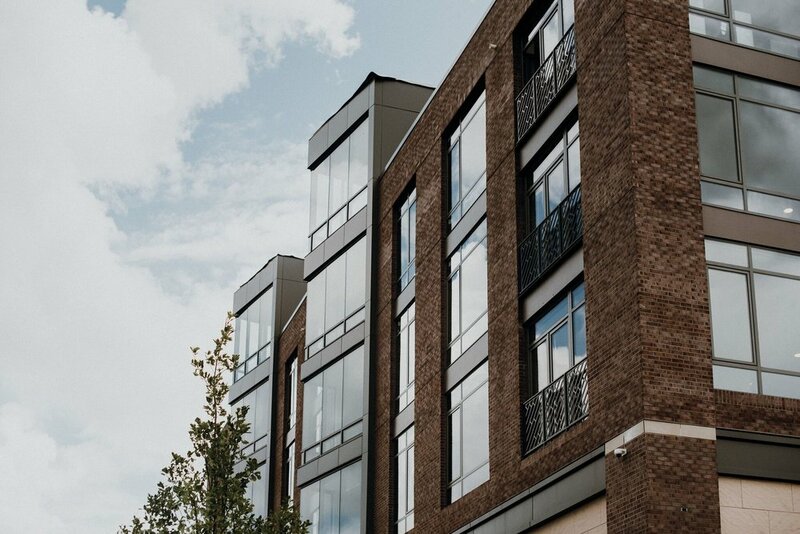 Six months prior to open, we began working with the Upstairs at Van Aken creators to position and identify their from scratch modern apartment building featuring 19 different floor plans including, 7 premium penthouses. The process began with logo and brand vision that went on to inspire interiors, messaging, stationery, photography, website and both temporary and permanent signage. Inspired by the sleek materials, we built a logo that was smart and graphic. We produced a system of communication pieces that reflected the Upstairs intentional design, expanse spaces and high-quality finishes. Business cards were letterpressed on a natural paper stock and feature a reflective pearlescent logo. Type is refined and nods to the subtle idea of “upstairs”. In addition to branding the building, we worked with the Upstairs management team to customize an existing website template to match the quality of the property. We crafted messaging and directed four photoshoots to market the living spaces and their timeless materials including porcelain, teak and quartz. We developed a system to display their 19 unique floor plans. We established a pre-open personality for promotional materials including billboard and construction hoarding. Once visuals were in place, we delivered a brand guide detailing voice, tone, characteristics, visuals and all things Upstairs to the marketing team to inform all communications moving forward and maintain brand consistency.